Mauritius is an absolutely stunning place to go and it is one of my top holiday destinations, which says a lot about it. I just had to write about why I keep going back there and why I will continue to go back there for as long it is possible in my life. I hope you enjoy reading about this place as much as I love going there. Mauritius is surrounded on all sides by coral reefs, these healthy reefs attract a lot of plant and other sea life. This makes visiting the reefs a definite highlight of Mauritius. It doesn’t matter if you choose to snorkel or experience the reefs by a glass bottom boat, it is going to be a stunning experience. 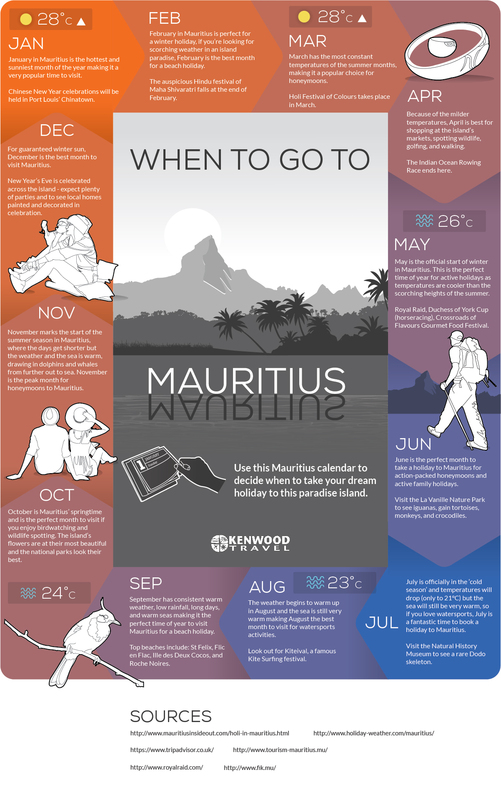 The weather there is great and someone made this infographic to show you the best time to go, but for me this could be any time of the year is perfect there. This is especially true when you consider that the weather rarely dips below 20 degrees Celsius and even in the colder months. Like most places with great reefs, there are also some really great beaches in Mauritius. Think white sand and the bluest water you have ever seen in your life. There is nothing better than sitting back and taking some time to watch the calm waters on a sunny and warm day. One thing I love about visiting is the warmth and proudness of the Mauritian people. They love where they come from and are happy for people to visit them there. You always get the sense that they want to share their island, rather than being suspicious of tourists, which occurs in many countries around the world. I have also had the opportunity to meet other people from Mauritius outside of the country and was always impressed by how warm and friendly they were.